If you'll recall, it was April of last year when we reported on pictures from Apple.pro, which claimed to show a seventh-generation iPod Nano chassis with room for a camera. Not long after, the site posted a second leak of the device, hinting at the omission of the Nano's famous clip in favor of optics. Fast forward to the present, and we're now looking another supposed shot of the unit, however, this time the clip is back and it's made room for the shooter. Like prior Nano-camera efforts, this prototype's loaded with a less-than-whopping 1.3-megapixels of resolution, which M.I.C Gadget claims in its non-final form, took overexposed photos. Apple's apparently also been toying with 2-megapixel prototypes, but those too were apparently deemed unsatisfactory. M.I.C. Gadget also muses the two month old prototype is nearing release, and that it could be released before the traditional fall schedule. Seeing as the Nano's long overdue for a hardware refresh, we'd file that under definitively maybe, but before believing, take copious amounts of salt as you hit the source link below for a bevy of pics. 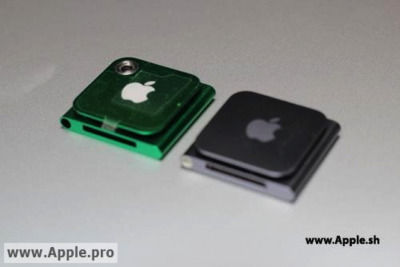 Supposed next-gen iPod Nano with camera leaks again, clip back in tow originally appeared on Engadget on Wed, 01 Feb 2012 18:08:00 EDT. Please see our terms for use of feeds.